This, un film de Romain Basset, was conceived under the working title "Fever" - which is much more apt for the feverish stream of surreal horror imagery, seemingly in tribute to yesteryear's hallucinatory Italian "giallo" cinema exemplified by cult-darling directors Dario Argento, Lucio Fulci, Michele Soavi (especially) and the father-son team of Mario and Lamberto Bava. Only here there's even less of a solid plot, if possible. Out-and-out horror films are a rarity in French cinema, to the point that a lot of the genre's Gallic fear-fests default to surrealist Jean Cocteau and his ORPHEUS and BEAUTY AND THE BEAST. 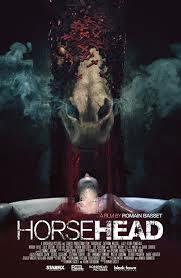 Well, HORSEHEAD isn't near that good, but one can at least see a certain influence in the thin plot, most of which appears to be a string of nightmares. A grandmother's funeral compels sylph-like Jessica (Lilly-Fleur Pointeaux) to reluctantly return to her family home and uncomfortable reunion with her mother (essayed by veteran Euro-shock actress Catriona MacColl). A disciple of "lucid dreaming," Jessica suffers repeated nightmares of a horse-headed apparition, obviously inspired by the fearsome steed in Fuseli's painting "The Nightmare" (that's the one with the little gremlin-like guy sitting on a girl's chest. And no, the gremlin-like fellow doesn't show up here. Maybe the sequel). These intensify as she overnights with her grandmother's corpse in the very same house, and Jessica "investigates" in her sleep, triggering flashbacks to her female ancestor's involvement in an occult-fertility ceremony involving some kind of nasty quasi-Catholic cult called St. Winston's Chapel. Is Jessica Destined To Give birth To The AntiChrist? Or possibly the AntiAntiChrist (which would be the Christ2). Or maybe she just doesn't get along with mom. Really, any interpretation is fair game, just as long as Horsehead trots in every so often and acts ominous, until Jessica faces the spectral animal in a showdown. While I completely get where you're coming from, I personaly loved this movie. For my money, it does a remarkable job of capturing the spirit of the seventies Italian horror flicks, with their complete and utter disregard for logic or storytelling conventions in favor of symbolism and atmosphere. In particular I was reminded of Argento's 'Suspiria' (could the character name 'Jessica' be a nod to Jessica Harper, star of that film? ), and the basic structure is a similar search for secrets, only brought down to the smaller scale of a dysfunctional family rather than a whole girl's dance academy. I also was reminded of Tarsem Singh's divisive 'The Cell', another visually compelling, heavily symbolic horror film that doesn't play to well if you're mainly focusing on the plot. As for what the film is about, I don't think it's nearly as up for grabs as you say. I would posit that at it's core, the film is about the poisoning effect of keeping secrets from one's family.